Prof. Matsuda: I was born in Tokyo, Japan, where I lived until 17. My Japanese-monolingual parents provided a literacy-rich environment for me to grow up in, which I am sure is partially responsible for my career choice as a language teacher and researcher, but they did not speak English or introduced me to the language. Eighth grade was the turning point for me as an English learner and a future English teacher. We had a new English teacher, Ms. Itoh—or “Kyoko-sensei” (Ms. Kyoko, with her first name) as we fondly called her. She was not an authoritative type and was more like a cool big sister than a teacher, but we respected her tremendously because she was fluent in English and had a lot of experience in using the language both in Japan and abroad. Explicitly and implicitly (i.e., sharing her experience using the language), Kyoko-sensei stressed that our ultimate goal in learning English is not to do well on the exam but to be able to use English to communicate in a real world. Her message was powerful and motivating: whenever we got lost among the vocabulary lists to memorize and textbook dialogues to practice, we reminded ourselves that they were step stones to become a successful English user like Kyoko-sensei. This experience has put the “classroom English” in a new perspective for me. Another way Kyoko-sensei empowered and inspired me was that she was not a returnee, a student who has lived abroad because of his/her parents’ business. By the 8th grade, English was already my favorite school subject, but I was convinced I would never be very good at the language because I was not a returnee. Our school had a number of children who have previously lived in an English-speaking country, and these children clearly stood out in English classes with their native-like pronunciation and fluency. Then I met Kyoko-sensei. She had visited but never lived abroad before, but she was very fluent in English and was comfortable using it. Observing the way she used English showed me that you do not have to be a native speaker or even sound like one to become a competent use of the language. After spending a year with Kyoko-sensei, I decided that I would become an English teacher like her. A teacher who knows that English is not merely a school subject but a living language in which people tell stories, have arguments, and make jokes. A teacher who can help students maintain a goal in language learning that goes beyond an immediate classroom. A teacher who can inspire students and serve as a role-model. My journey to become an English teacher began then. It is amazing to realize that my interests as a teacher and researcher have not really changed since the 8th grade. As a teacher, I constantly push students to make connection between the course materials and their life outside of school. My perspective as a teacher and researcher still focuses more on the language use in communicative contexts than the form of language itself. And both as a teacher and researcher, I am interested in preparing nonnative speakers of English become an effective user of English, especially in an international context. Although the specific details may change over time, these themes will probably guide my professional career for many more years to come. Ana Wu: Some of your areas of research are the studies on teaching English as an international language and World Englishes. As an expert, how do you think professors could create courses which students are exposed to world varieties of English, gain cross-cultural awareness, and engage in critical inquiry about the English language? What suggestions would you give? Prof. Matsuda:It would be impossible to suggest one “perfect” syllabus for all as I believe that teaching is a highly contextualized thing. Factors such as students’ interests, goals and academic readiness as well as the bigger picture of the curriculum and the teacher’s interests and expertise should all be taken into consideration when creating a course. World Englishes studies naturally include the discussion of different varieties of English (or Englishes) that have emerged as a result of the world-wide spread of the language. In my course, I used the internet and other resources to expose students to both written and oral samples of Englishes found in different parts of the world. Since many of students were linguistic majors with some experiences with linguistic analysis, we sometimes tried to analyze the features of a particular variety of English. One of the most popular activities was to read articles from English newspapers across the world, written about the same event. We compared and contrasted the lexicon and syntax of Englishes as well as different genre conventions, rhetorics, and even the contents of those articles. I also made sure that students were exposed to another “-es” of Englishes, which is the diversity in functions the language performs. We discussed the use of English as the dominant language in a society (i.e., UK, US), as an intranational lingua franca (i.e., India, Singapore), and as an international language. We also explored the English use in different mediums (e.g., ads) across the world. Since many of my students had never been out of the region of the country they lived in, one of my goals was to expand their interests to other parts of the US as well as to the world. When selecting readings and visuals for the class, I made sure that they represented different regions of the world and countries students were less familiar with. Although the course was titled “World Englishes,” our discussion was never limited to the language itself. The diverse background of students (e.g., linguistics, literature, composition, creative writing, education, history, political science, international relations) was a great asset to this course because all contributed their own interests and expertise during the class discussion, which often showcased the interdisciplinary nature of the World Englishes studies. A several weeks of the courses were devoted specifically to talk about the social, cultural, political, economical and pedagogical implications of the world-wide spread of English. One challenge of this course was to bring the World Englishes discussion “home”—some students, especially undergraduate students, struggled to relate to issues abroad because it was too far from their reality. And this was one point I did not want to compromise because I strongly believe that we learn best when we make connection between what we are learning and our “real life.” One strategy I used to address this challenge was to bring in several international students and put students into small groups for conversation. My students asked questions about the guests’ experience in learning and using English back home as well as in the US, but they also enjoyed “typical college conversations” about parties and other cultural events. This conversation helped my students see that these people students read about may use English in a very different way from them but yet they are in fact real people like themselves. 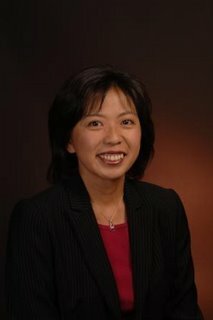 Ana Wu: As one of the first leaders of the NNEST Caucus, what improvements have you witnessed in the past 10 years, and what would you like to see the members do or initiate? Prof. Matsuda: Tenyears ago, the NNEST issues were not even considered as a legitimate research topic by most people. Now, we see a number of high-quality research publications and conference presentations. Even among TESOL professionals who are not particularly dedicated to NNEST topics, we see increased awareness of the strength of NNESTs and complexity of NNEST issues as well as the positive changes in people’s attitudes. The NNEST Caucus and the hard work of its members are responsible for these exciting changes, and I am confident that the things will keep moving forward even after the caucus becomes an IS or another kind of group. I do believe, however, that it is important to remember that not everyone is “moving forward” in the same way. In TESOL, we continuously have an influx of new professionals who struggle with the biases and sense of insecurity many of us felt 10 years ago. There are many language program administrators and teacher educators who have not been exposed to NNEST research and discussion. We need to keep reaching out to those people and help them become better informed and empowered, just like we were through our involvement with the NNEST caucus. Ana Wu: If you were to name a (or a few) seminal paper on NNEST issues, what would that be? Why? Prof. Matsuda: I would choose “Non-native educators in English language teaching” (1999; edited by George Brain). Many people would probably agree with me as it is one of the first (or THE first?) book that specifically focused on NNEST issues. The book presented the collective voice of NNESTs and put the NNEST issues on the radar for many TESOL professionals. Looking back, I cannot believe how stupid I was to let go of such an opportunity. But I appreciate how this book helps me remember what it was like for me 10 years ago. It reminds me that there are many novice professionals who are as vulnerable as I was back then and could use a bit of mentoring, encouraging and nudging to flourish. Ana Wu: You and your husband, Prof. Paul Kei Matsuda, are much respected leaders in the teaching community. Besides collaborating in publications and giving presentations together, you both teach in the same university. What is it like to be married to another professional from your field and how does it affect yourself as a professional? Prof. Matsuda: People often ask what it is like to have my husband working in the same field and at the same school. This is a tough question to answer—not because I find it too personal but because I don’t know it any other way. We got married in June 1995, and two months later, we started our graduate studies (MA for me and PhD for my husband) together in the English department at Purdue University. Since then, except for one year immediately after we finished our PhDs, we have been always at the same school (in fact, in the same department until this year). While we have distinctive identities as scholars and have topics and fields that each of us claim as “(primarily) mine,” our professional interests overlap significantly and we often go to the same conferences. For me, it works well that we share much of our professional context. First, it is convenient to have someone nearby who not only understands what kind of work I do but also who also knows about the field himself. I can bounce of my research and teaching ideas and get immediate and informed feedback, pretty much 24/7. This is a privilege not many people have. For ESL teachers and researchers, it is not rare to be the only ESL person in the entire department or at the school, and this kind of conversation needs to be reserved for conferences. Having an easy access to a colleague, especially a good one, is a definite plus. Second, it is nice to have a colleague who shares the institutional context (i.e., thoroughly familiar with the culture and politics) but yet is not in the position to evaluate me professionally. When I am feeling frustrated or disappointed at work and when I feel too vulnerable to talk to my colleagues, it is nice to have someone I can show my insecurity without having to explain the context. I am lucky enough to have several colleague-friends whom I can share my concerns, but I feel even luckier that one of them is married to me. Third, I like that my husband understands what I do and what is important for me. I like being able to share everything with my spouse and the fact that we do similar things makes it easier. He understands that the “break” is not a break for me but the time to catch up with work. He understands why I am stressed right before a conference. He understands why I want to publish things for no money. My work and doing a good job with it are important for me, and I appreciate that Paul understands it and also shares the same values. This entry was posted in Uncategorized on February 24, 2008 by AWu.